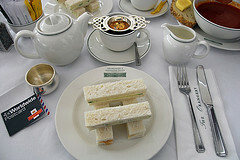 The cucumber sandwich recipe has long been synonymous with afternoon tea. In fact, whenever I think of tea parties, that is one of the first things that comes to mind. Well, that along with crumpets. My idea of a sandwich with cucumbers is not quite the way they are normally prepared for a tea, though. I usually toast two slices of whole wheat bread. Spread them with mayonnaise. Slice an English cucumber. Slice a tomato. Layer on the cucumber slices alternately with the tomato slices. Sprinkle with black pepper and enjoy immediately! The perfect vegetarian meal. Although sometimes I'll add a single slice of turkey lunch meat or a couple slices of cheese on top. As you can see, my version of the cucumber sandwich recipe is not particularly dainty. And I almost always need at least a few napkins to catch drips from the juicy tomatoes. I suppose the combination would work if it were more carefully prepared. The history of this sandwich goes way back to the Victorian and Edwardian Eras. It was more connected to people of upper class who could indulge in such an unsubstantial meal. Lower classes traditionally ate meat with their tea to sustain themselves until the heavier evening meal. (Note: Clicking on image will open a new window). How do you make this sandwich? Typically it is made using white bread with the crusts removed. Each slice is lightly buttered. The cucumbers are slice paper thin – so thin you can read a newspaper through them. The sandwiches are usually cut diagonally into triangles. They are then stacked neatly on a tray to be served with the accompanying tea. Many a tea party serves this dainty sandwich along with small cakes, cookies, or tarts. The idea is to not have to work at anything, chewing in particular. A bite or two..., a sip of tea..., another bite...wipe the corners of your mouth..., and you're finished. A social occasion not meant to fill you up, with food anyway, company perhaps, but not food. Looking for the recipes? Click here to go to Part 2.